Avi Bundt, junior, dives in to compete in the 100 yard freestyle at True Team Sections on Jan. 21. 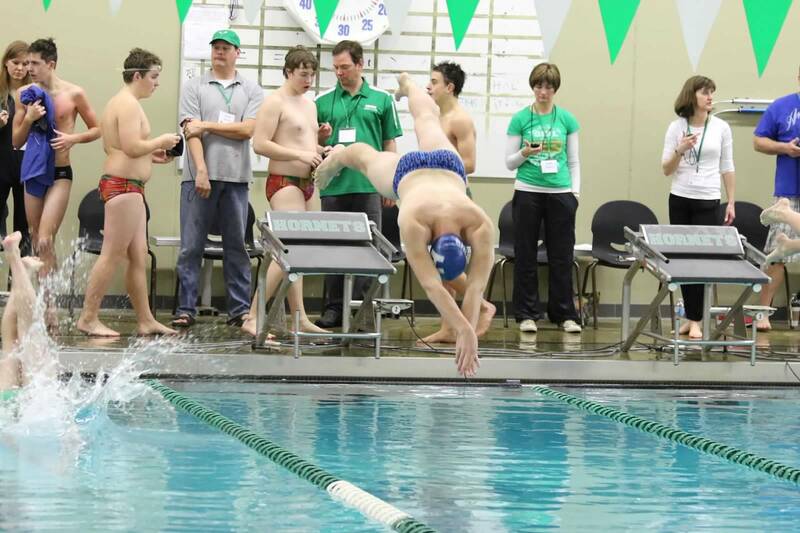 Bundt placed eighth in the event with a time of 53.84, and the Royals placed third out of eight teams. The HHS boys swim and dive team is currently in the midst of their season, and team captain Avinoam Bundt, junior, is helping lead the way to their success. Bundt, who usually swims the 50 freestyle and 100 freestyle, hopes to make it to the Class AA state meet this season. He has been a member of the varsity team for four years. During the 2015-2016 season, MSHSL competitive sections were rearranged, and the Hopkins Royals have clearly benefitted. Now in section 6AA, the Royals compete against teams such as St. Paul Academy and St. Louis Park. Having previously swam against schools like Minnetonka and Wayzata, the Royals have had more success this season because their new section is not as fast and are competing against schools similar in size. “This makes it easier to place higher,” Bundt said. The switch to a new section has clearly been helpful for Bundt and the rest of the team, as the Royals took 3rd place at True Team Sections on Jan. 21. They also beat Watertown in a dual meet on Thursday, Jan. 5. The 2016-2017 swim season is also the team’s first with Mr. Jared Anderson as head coach. Anderson has been a key factor in the team’s success this season. “A lot of team members have improved times and he brings a new coaching style for the team that has gone very well,” Bundt said. Though swimming is an individual sport, there is a strong focus on the team component. Bundt’s favorite part about being on the swim team is, in fact, its members. “It is a good group of guys,” Bundt said. Bundt and the rest of the Royals take on Edina on Friday, Feb. 3 at Art Downey Aquatic Center.